The Virginia Space Grant Consortium (VSGC) Graduate Research STEM Fellowship Program provides fellowships of $6,000 in add-on support to graduate students to supplement and enhance basic research support. Applicants must be enrolled full-time in a program of study in science, technology, engineering, or math (STEM) and have a specific faculty-mentored research project that has NASA or aerospace relevance. Applied Health Sciences majors are not eligible for this program. The purpose of the VSGC Graduate STEM Research Fellowship program is to encourage talented individuals to pursue careers in STEM and support NASA’s mission. Awardees will be required to certify through their academic department that basic research support of at least $6,000 in matching funds is also being provided before funds are released. These Fellowships are intended to enhance basic graduate support such as graduate research assistantships, graduate teaching assistantships, and non-federal scholarships and fellowships. Research Proposal aligned with NASA’s mission – VSGC’s graduate STEM Research Scholarship Program encourages talented graduate majors to pursue aerospace-related fields and do research with a strong alignment with NASA’s four Mission Directorates. Applicants should submit a proposal for research that is 2-3 pages (not including references) and clearly describes the research objective and methodology. A statement written by the student in consultation with the faculty advisor should describe the key elements of the proposed research and plan of study. All research projects must be mentored by a faculty member and this mentor will be required to submit a letter of reference for the project. Applicants will be asked to specifically identify how their research relates to NASA’s Mission Directorates. The selection committee is made up of university faculty in a variety of disciplines. Applicants should present their proposed research in a form that will be understandable to a range of readers. Only one graduate Scholarship application per student per year is allowed. 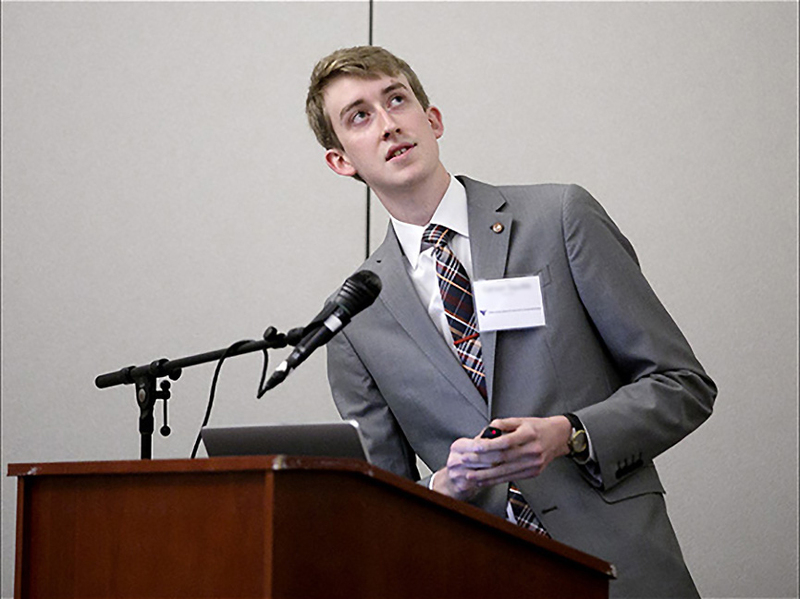 For a list of research titles and abstracts recently funded by the VSGC through the Undergraduate STEM Research Scholarship Program, visit the VSGC Student Research Conference website. 1.Letters of Recommendation – provide the names and contact information for two references of which one must be the applicant’s current faculty advisor. Letters of recommendation should assess the applicant’s potential as well as his/her progress and academic achievements. The on-line application system will contact both references via email to request a letter of recommendation on behalf of the applicant. We suggest that you inform both of your references that they will receive an email from the VSGC in reference to your application. Your references will be provided with a link to submit their recommendations. We must receive both recommendations by 11:59 p.m. on February 4, 2019 for your scholarship application to be complete. 2.Transcript – An unofficial transcript with all grades through fall semester 2018 is required and can be submitted as a PDF in the online application (upload as an attachment). If the applicant is selected to receive an award then a transcript will be required at acceptance. If the applicant does not have a PDF conversion tool, links to free on-line PDF converters are provided in the application. An online PDF converter can be found here. If the scholarship recipient terminates his/her academic program during the 2019-2020 academic year, the University is required to return a prorated share of the scholarship award to the VSGC. Scholarship funds are not transferable. Any unused funds should be returned to us. January 28, 2019: Applications are due before 11:59 p.m. on this date. Early April 2019: Awards will be announced with funding provided to students through the universities for the 2019-2020 academic year. A printable flyer for the Graduate STEM Research Fellowship Program can be found here. Sample proposals for the Graduate STEM Research Fellowship Program can be found here. Applications are due by 11:59 p.m. on January 28, 2019. A printable flyer can be found here.